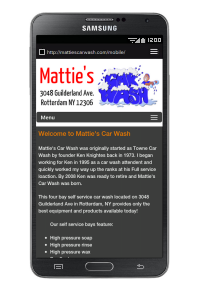 Mattie's Car Wash was originally started as Towne Car Wash by founder Ken Knightes back in 1973. I began working for Ken in 1995 as a car wash attendent and quickly worked my way up the ranks at his Full service loaction. By 2008 Ken was ready to retire and Mattie's Car Wash was born. This four bay self service car wash located on 3048 Guilderland Ave in Rotterdam, NY provides only the best equipment and products available today! We also provide 3 high powered vacuums, vending products, change machine, and ample space for drying / detailing your vehicle. Mattie's Car Wash is open 24 hours a day, locally owned for instant help with any problems that may arise. We maintain on a regular basis to make sure you can clean your vehicles any time.